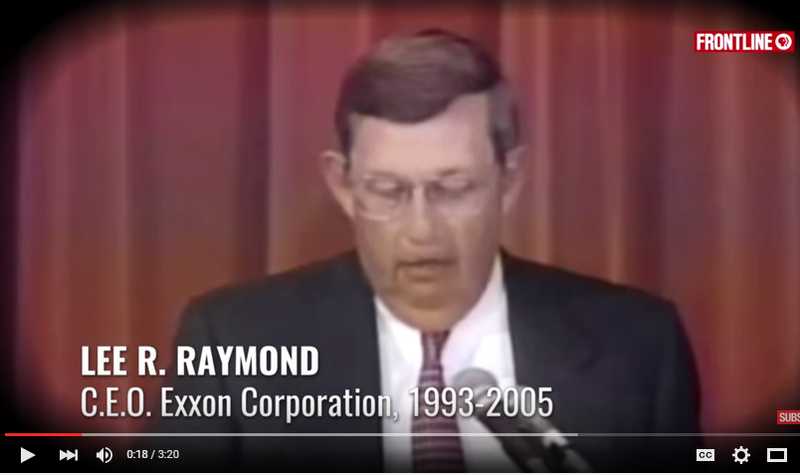 Exxon CEO Lee Raymond, lying to stockholders in 1996. Last week I told you a wonderful story of Exxon and Shell and Global Warming. Specifically, I relayed the information now made available about how back in the late 1970’s, Exxon’s research scientists confirmed a link between the burning of fossil fuels and climate warming (and kept the news to themselves). Shell Oil’s disingenuous ways involve what it tells the world about climate change (nothing to see here) and what it talks about for internal planning purposes (4-6c increase in global temperatures in the near term. It’s all here if you need it. If you’ve tired of arguing with your global warming-denying cousin Joey over the data, this should be the nail in the coffin for him. It won’t be, of course–just a few days ago, The Donald came forward and declared himself a denialist (not that we should be surprised). But anyone expecting better news about the behavior about the 1% plutocrat class needs to find it elsewhere. There’s news that Volkswagen has been gaming the actual emissions on its cars–the internal computer that controls the engine power has a ‘test mode’ that puts out considerably less in the way of emissions than what the car might put out while rolling along the US version of the Autobahn. That’s helping to wreck the environment. And as pointed out here, the disclosure also helps nuke the idea that there’s any such thing as an auto company interested in the environment. Hey, GM doesn’t even care overmuch when its customers DIE due to manufacturing problems on the ignition switch–why should we expect them to care about the environment? And then there’s this scumbucket Avatar of basic human decency. 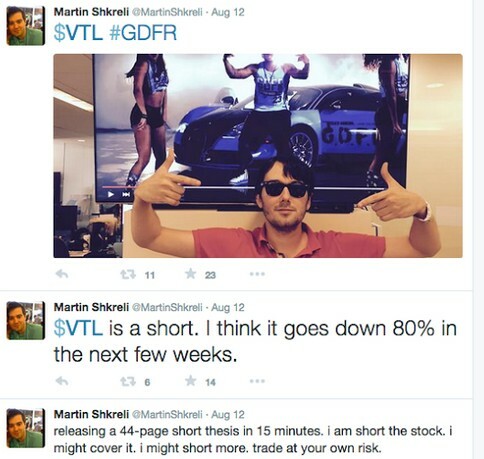 Martin Shkreli is a hedge fund guy with a checkered background. But his background was not checkered enough to keep him from buying the rights to critical pharmaceuticals. He bought out production rights to daraprim, a drug that is in many cases the only treatment available to ward off toxoplasmosis and other opportunistic infections in people with immune systems compromised by HIV or immuno-suppressive drugs used for cancer patients and transplant survivors. After his purchase of daraprim, he then got a bit more aggressive about his monopoly–the price of the drug went from $13.50 per tablet to $750. And even though he has (apparently) rolled the price back on the drug, his actions stand as a pointed reminder of the problem (most prevalent in this country) of treating medicine as just another perfect place for a thriving free market. Instead, he’s reminded us all (as if we needed reminding) that medical treatment is the most horrid example of hostage capitalism. The prior generations of plutocrats at least understood that the house of cards that is capitalism cannot work without a working class with enough discretionary income to purchase the products the plutocrats are putting out. But over the past 40 years, there has been a huge shift of money from the purchasing class to the ruling class. In the US, falling wages were covered over by two-income households and home equity loans. But that game is over (in the US at least) now that adult participation in the workforce has fallen to its lowest level since the 1970’s. Slamming on the brakes for the oil/fossil fuel business (in order to avoid extinction level warming) is perhaps the death knell of capitalism and industrial civilization. In the meantime, as we circle the drain, we are perhaps seeing the corruption inherent in the status quo. All of the schemes to separate the 99% from their wealth are coming unwound, and the blowback will be ugly.